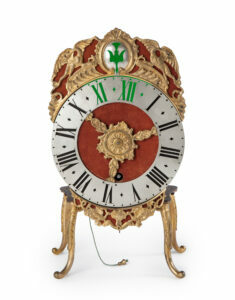 The circular enamel ring dial is set in a gilt-brass pearl string on the outside and a rope ring on the inside. The chapter ring has Roman hour, Arabic five-minute and minute divisions, as well as an Arabic date ring in red. 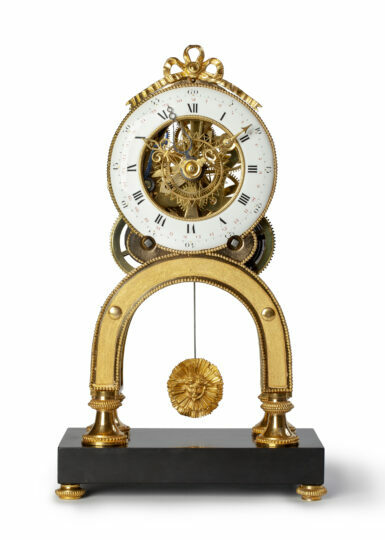 The time is indicated by a fine period pair of pierced and engraved gilt-brass hands, whilst the date is indicated by a pierced blued-steel pointer. 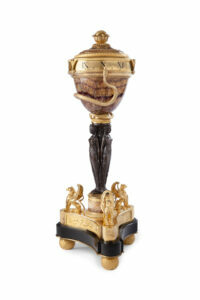 The gilt-brass skeleton is situated on a black marble base and is embellished by pearl strings. 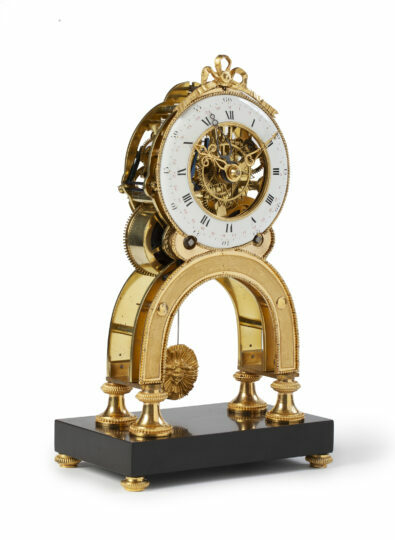 The movement rests on two arches on four shaped feet. 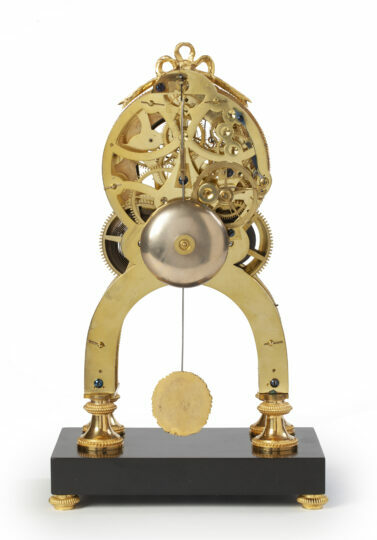 The pendulum, which has an Apollo-shaped bob set in a sunburst backdrop, oscillates between the arches. The dial is surmounted by a looped ribbon with bow. Apollo alias the sun god (Phoebus Apollo= the radiant) is one of the twelve gods of Olympus. He was the son of Zeus (Jupiter) and Leto and the twin brother of Artemis (Diana). He later became identified with the sun-god Helios (Sol). He represented the ideal form of male physical beauty. He is usually portrayed as a young man, beardless, with delicate, sometimes rather effeminate features. His hair is long. 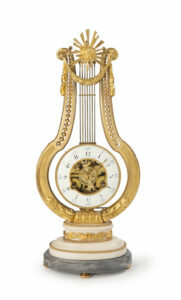 He is often depicted with a lyre as he was the patron of music and leader of the Muses.